Prestashop is one of currently popular platforms that developers shouldn’t ignore if they are tied to eCommerce development. Its prospects got even higher since few months ago submission form advancements took place. Developers began to rely on Prestashop constant growth and submit modules more readily. This is the main reason why we have observed the steady increase of addons on monthly posted analytics graphs. However, May 1 revealed the unexpected occasion, happened with Prestashop modules within a month. The total number of modules was decreased, comparing to the statistics on April, 1! It means nothing but Prestashop administrators started revalidating modules and incorporated the policy of filtering & sanitizing. Apparently, they found some modules on its frontend not good enough to match Prestashop rising standards. 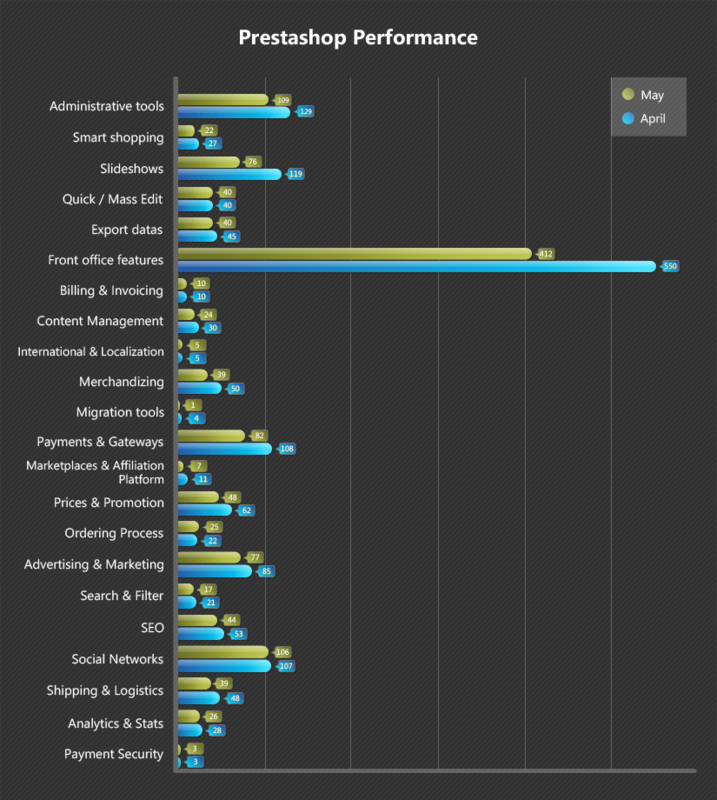 Front office features are still a leading Prestashop category, but more than hundred modules were removed from there. Almost all categories demonstrate decrease in their content. What could we expect this June?